[XPB-7778XDRK] Wood Seat Locker Bench is 18” H x 9-1/2” D and includes two (2) 3” diameter bolt mounted aluminum pedestals with four (4) mounting holes to secure to the ground. The seating area is constructed of attractive butcher block wood and features a dark finish. 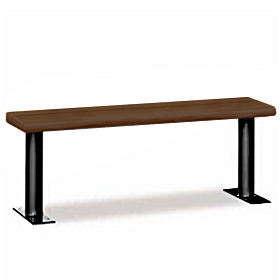 Dark finish wood locker benches are available in lengths ranging from 3' to 8' lengths in 1 foot increments. Solid wood locker benches are easily assembled. Pedestals have a powder coated black finish. Dark finish wood locker benches are delivered unassembled. For shipping quotes, orders or questions please call our Customer Service Center at 1-877-483-9270.